One factor that weighed heavily in the USDA decision is military interest in the fast-acting, super-potent opioid tablet. The military wants to explore whether the pill can be used as a battlefield painkiller. The Pentagon has spent millions helping to fund research. 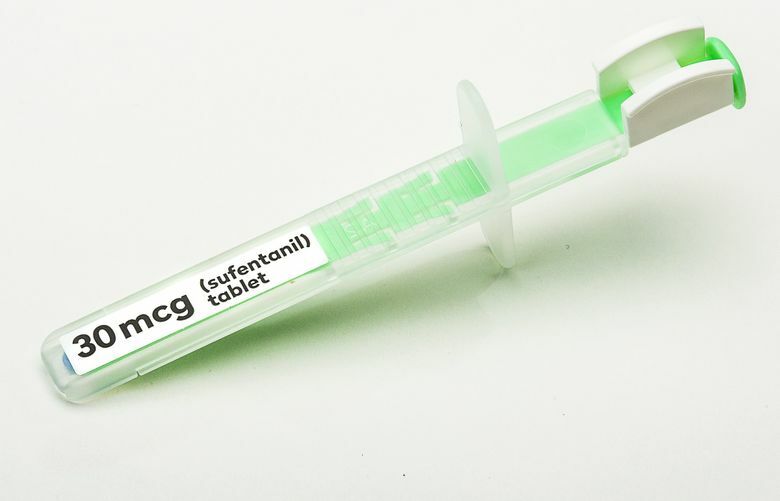 WASHINGTON – The Food and Drug Administration approved a powerful new opioid Friday for use in health care settings, rejecting criticism from some of its own advisers that it would inevitably be diverted to illicit use and cause more overdose deaths. The drug is five to 10 times more potent than pharmaceutical fentanyl. The tiny pill – just three millimeters in diameter – is likely to worsen the nation’s drug crisis, according to critics and the head of the FDA’s advisory committee on painkillers. As the worst drug crisis in U.S. history has accelerated, agency critics and some public officials have clamored for that holistic approach to narcotic painkillers, instead of the FDA’s practice of evaluating each opioid application on its own. Gottlieb has pledged that the FDA would do more to balance efforts to curb the epidemic–which killed a record 49,000 users in 2017, according to preliminary data–with the needs of people who need strong pain relief. But Friday’s statement is the first detailed indication of how the FDA might use its drug-review process to tackle the overall problem. Gottlieb said he would bring a plan to the FDA’s Opioid Policy Steering Committee and perhaps Congress. The guidelines would allow the agency to consider a narcotic’s benefit to public health, its risk of being diverted for inappropriate use or abuse and its unique benefits to groups of people in pain before deciding to approve an opioid. “In this way, [drug companies] would know up front where the opportunities are for developing new drugs that meet the FDA’s standards for safety and effectiveness,” he wrote. “It is certain that Dsuvia will worsen the opioid epidemic and kill people needlessly,” Sidney Wolfe, founder of Public Citizen’s Health Research Group, said in a statement. “It will be taken by medical personnel and others for whom it has not been prescribed. And many of those will overdose and die. “Clearly the issue of the safety of the public is not important to the commissioner, despite his attempts to obfuscate and misdirect,” Brown said in his joint statement with Public Citizen. A 2016 survey conducted by the federal Substance Abuse and Mental Health Services Administration shows that narcotics are rarely stolen from doctor’s offices, clinics, hospitals or pharmacies. Fewer than 1 percent of people said they acquired opioids that way. One factor that weighed heavily in the Dsuvia decision is military interest in the drug, Gottlieb said in his statement. The military wants to explore whether the pill can be used as a battlefield painkiller that is less cumbersome than liquid analgesics. The Pentagon has spent millions of dollars helping to fund AcelRx’s research, public documents show. “The FDA has made it a high priority to make sure our soldiers have access to treatments that meet the unique needs of the battlefield, including when intravenous administration is not possible for the treatment of acute pain,” Gottlieb wrote. “The FDA approval of Dsuvia is the culmination of nearly 15 years of research to improve the standard of care for managing acute pain in medically supervised settings,” Palmer said in a statement.